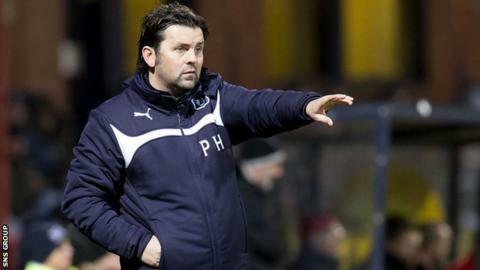 Manager Paul Hartley believes Dundee are on the right track one year after his move to Dens Park. "It's been eventful," he told BBC Scotland. "There's been a lot of changes on and off the field. "I had to get a better squad to make sure we could compete in the top flight, so we've managed that. "We had a big turnaround with 18 players in and 15 out, but it's been good and hopefully we've a few more years ahead of us to look forward to." Having achieved back-to-back promotions with Alloa Athletic, Hartley, 38, resigned from his post and, soon after, replaced John Brown at Dens Park with Dundee second in the Championship. He successfully steered the club to the title and the Dark Blues currently occupy seventh place in the Premiership. "I think things are going well," he added. When I took the job over there were things I had to do." Cardiff City were impressed by Hartley's methods and made an approach in September, which was turned down. "I'm settled here," he explained. "I think we have a big job on our hands. "It's a job that I'm enjoying and there is a lot of unfinished business in terms of building the squad and the whole club. "I've got a good group, I work with good players, staff and board." Having beaten Aberdeen in the previous stage, Dundee host Celtic in the Scottish Cup fifth round in Saturday's lunchtime kick-off. "We know it's going to be an extremely hard game but it's one we're really focused on and looking forward to," said Hartley, who spent two-and-a-half years as a player with the visitors. "We're six games unbeaten, so we've been consistent over the last few weeks and we need to try and keep that going. "We've got a chance to progress to the quarter-finals and supporters always look forward to a good cup run. "We need to have a go at Celtic, there is no point sitting back and waiting for something to happen, we need to try and make things happen but we also need to have good discipline and keep our concentration."